WASHINGTON -- Secretary of State John Kerry is heading to Russia to meet with President Vladimir Putin on his first visit to the country since relations between Washington and Moscow plummeted to post-Cold War lows amid disagreements over Ukraine and Syria. The State Department said Kerry would meet Putin and Foreign Minister Sergey Lavrov on Tuesday at the Black Sea resort of Sochi. But in a sign of the considerable strains, the Kremlin said Putin's attendance had yet to be confirmed. "This trip is part of our ongoing effort to maintain direct lines of communication with senior Russian officials and to ensure U.S. views are clearly conveyed," State Department spokeswoman Marie Harf said in a statement. In addition to Ukraine and Syria, she said the talks would also focus on the ongoing nuclear negotiations between Iran and the group of nations known as the P5+1 - Russia, the United States, Germany, Britain, France and China. 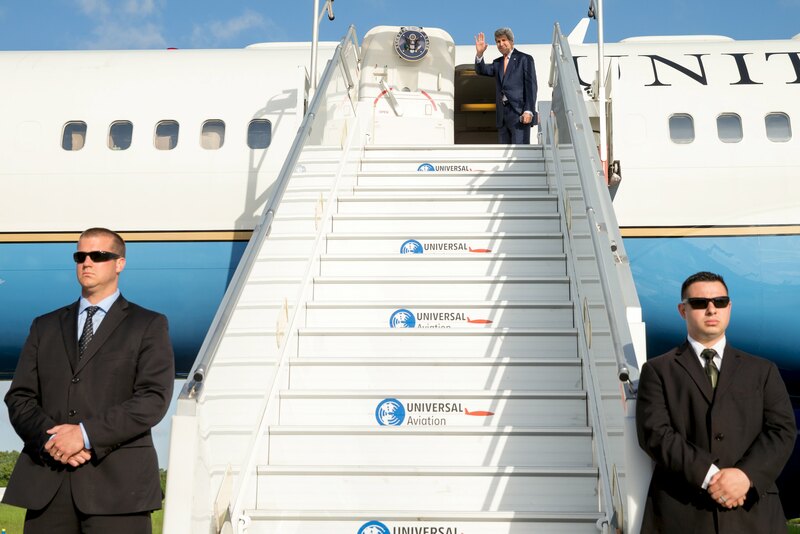 The short trip to Sochi will be only Kerry's second to Russia since taking office. He first visited Moscow in May 2013 and had meetings with Putin and Lavrov before the Ukraine crisis erupted and Russia annexed the Ukrainian territory of Crimea in early 2014. The meeting will occur amid tensions that Moscow squarely laid on Washington's doorstep in a statement released Monday by the Foreign Ministry. While saying it hoped Kerry's visit will "normalize bilateral relations on which global stability largely depends," it also blamed the United States for provoking the Ukrainian crisis by isolating Russia and prompting its allies to follow suit. "We emphatically raise the issue of the need to resolve the problems created by Washington in our bilateral agenda," the statement said. Ukraine has served as the main source of discord in dialogue between Moscow and Washington. The western-backed government in Kiev continues to be embroiled in a sporadic conflict between government and separatist rebel forces in its eastern regions of Donetsk and Luhansk despite a cease-fire agreement sealed in mid-February. Western nations have accused Russia of supporting the separatists with arms and manpower - a claim that Moscow has denied. Underscoring the animosity, the Russian foreign ministry on Monday blamed the United States for the unrest in Ukraine and said Washington was trying to isolate Russia on the international arena. Moscow has bristled at Washington's pledge to provide Ukraine with military assistance in the form of hardware and training. In late April, troops from the United States and Ukraine kicked off joint training exercises intended to help bolster Ukraine's defenses. The exercises, dubbed "Fearless Guardian-2015," sparked outrage from Russia, which described them as a potential cause of destabilization. During a visit to Moscow on Sunday, German Chancellor Angela Merkel urged Russia to use its influence to persuade separatists in Ukraine to abide by the oft-violated cease-fire. Ukraine says more than 8,000 people have died in the conflict that began in April 2014. Russia has stuck firmly to the line that the Ukrainian government retains the bulk of responsibility for bringing about a settlement. "We will use all the influence we have on the leadership in Donetsk and Luhansk to ensure the process proceeds at the required pace and attains the necessary level," Putin told Merkel on Sunday. In February, Kerry said that Russia had repeatedly lied to him about its activities in Ukraine where pro-Russian rebels are fighting national forces. "Russia is engaged in a rather remarkable period of the most overt and extensive propaganda exercise that I've seen since the very height of the Cold War," Kerry told a Senate Appropriations subcommittee. "And they have been persisting in their misrepresentations - lies - whatever you want to call them about their activities there to my face, to the face of others on many different occasions." Diplomats in Moscow and Washington remain at odds over a range of other international issues. Russia last month announced it would lift a five-year ban on delivery of the S-300 air defense missile system to Iran, drawing a hasty rebuke from the United States. The White House said the missile system would give the Islamic republic's military a strong deterrent against any air attack. The Kremlin argues that the S-300 is a purely defensive system that will not jeopardize the security of Israel or any other countries in the Middle East. On Syria, Russia has defied a chorus of international condemnation to remain fast to the embattled government of President Bashar Assad. Following his stop in Sochi, Kerry will travel on to Antalya, Turkey, where he will attend a meeting of NATO foreign ministers on Wednesday. Kerry will return to Washington that same day to attend meetings between President Barack Obama and top officials of the Gulf Arab states, who are concerned by the possibility of a nuclear deal with Iran.